I’ve never been overly outward with any of my thoughts and opinions before. Who am I to decide what’s right and what’s wrong? What if I make the wrong choice? What if others don’t see eye to eye with my beliefs? Perhaps it is my people-pleasing core that has left me uncertain of my own beliefs and lacking in a sense of self-concept. My time spent with the 2018 YMCA SA Youth Parliament program, personally sponsored by the City of Salisbury, has really challenged these beliefs. 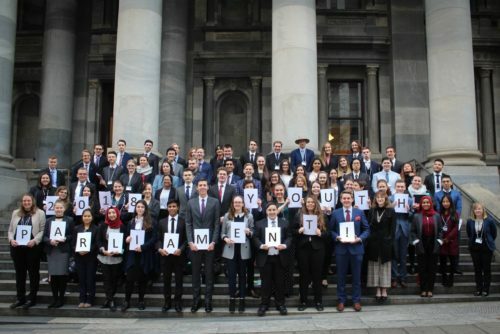 So you may be wondering, what is Youth Parliament? The YMCA is a prominent community organisation on both a national and state level working toward creating opportunities for people and communities to connect with a better life. 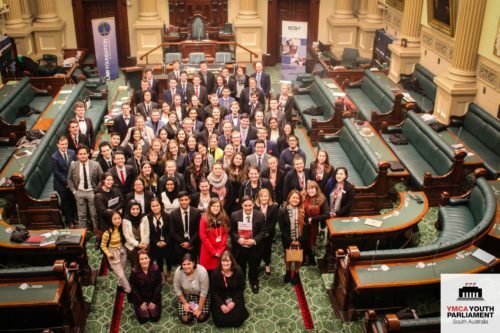 This year saw the YMCA celebrate their twenty-third session of Youth Parliament in South Australia, though the program has been running in Australia since 1963. The program provides a non-partisan platform for young people aged 15 to 25 to have a say on important issues, build skills and gain an understanding of parliamentary processes. And oh, how it did. From March to July, our teams, spanning across South Australia (and we’re talking Whyalla to Kangaroo Island! ), were invited to draft and create a bill of our own. Our bills addressed issues we believe represented the views and the future of young people. A Residential Week hosted at Woodhouse Activity Centre, complete with daily trips to Parliament House, gave us an opportunity to analyse and debate each team’s bill in depth. We were subject to Parliamentary procedure acting as the Government and Opposition in the seats of the Legislative Council and the House of Assembly. Bill topics covered everything from mandatory disability education, to regional transport access and my personal favourite digital direct democracy. Yes, okay, you’ve got me. That was my team’s bill. However, I am excited about this bill for reasons other than that I got to stand up and engage in fierce debate. The reason I am excited about this bill is because places like the Centre for Democracy exist. It is absolutely thrilling to know that our ideas and beliefs extend much further than the Youth Chamber; that our heated arguments are not for nothing and that young voices may have the chance to make a real difference to our state in times to come. The concept of the Digital Direct Democracy Bill 2018 aimed to address the issue of public democracy. Our idea was to initiate a digital voting platform monitored by a new branch of the Electoral Commission of South Australia (ECSA) known as the Digital Electoral Commission of South Australia (DECSA). Members of the public would be able to make digital formal votes regarding issues that mattered to them on a frequent and consistent basis. The concept of digital direct democracy is not new – and by no means was our bill the perfect representation of its full potential. Throughout the bill writing process we looked to Norway and Switzerland, who are already attempting alternate methods of democracy. It is societies like these that emphasise a ‘people-first’ approach to democracy, and consequently experience such prominent levels of trust in their own Governments. The bill writing process really challenged my beliefs as I came to realise I didn’t just have to accept things for the way they are; even the best systems can be better. Our bill was based on a few key motivations. Firstly, as members of a society – and particularly as young people – often we find that not every issue we care about is accurately represented by our respective Members of Parliament. We are very lucky to elect our MPs, especially when many countries do not even grant the right to vote, or are faced with political corruption. However, we believe that having just one person to represent the beliefs of each individual within an electorate is not necessarily the most inclusive nor representative method – this goes against the very principles of democracy! Granted, the idea of digital democracy is not to abolish the role of Members of Parliament, rather, it sees them as advocates for their electorate and educators of public issues of importance. Furthermore, technological advances mean that as time progresses we will need to look at alternative methods of voting beyond traditional ballot papers. Our youngest generation are the by-products of the digital age – it makes sense that our electoral processes reflect this. Our team was privileged to meet with the current Electoral Commissioner, Mr Mick Sherry, who was in full support of a digital voting model. While currently Australia does not have the security measures in place to support a digital voting platform, the Commissioner assured us that this alternative model of voting is on the horizon. In essence, the heart of our bill lies within the desire to strengthen the voice of ‘ordinary’ people. I believe strongly in encouraging meaningful and well-informed participation in the democratic process for all. 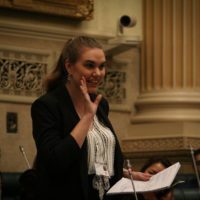 As a Youth Parliamentarian, I was lucky enough to have a chance to put my voice forward and speak for those with similar experiences to me – but even at 19 I know that I will never fully grasp the individual circumstances of every person I meet. Yet, whether one considers themselves politically driven or not does not change that they are affected by the outcomes of politics, nor does it remove their individual opinions, thoughts and beliefs about the world around them. YMCA Youth Parliament was an experience much bigger than just this bill. I realise now that there is so much more to learn about other people than what is just put forward to us in our surroundings growing up. I felt understood and respected, and wholeheartedly listened to, even when my thoughts didn’t necessarily meet eye to eye with others. Debating for the first time had me feeling so vulnerable, yet quiet words of encouragement amidst the loud debates was something I really cherished. I never thought six months ago I would have be so open about my visions for the future. But as I share these ideas with more and more young people, more ‘real’ grown-up connections like the Centre of Democracy and the Electoral Commission of SA, I realise the power of having this voice. I can’t take it for granted. In my life I want to be sure that every Australian’s voice can be heard truthfully and accurately. I want to know that our political leaders are acting upon our very real needs for what they are, rather than what they make them out to be. A digital voting platform might be a small step, but it may also be the first step that takes us on journeys unimaginable. Eloise Duncis-Atterton, 19, is a second year Bachelor of Social Science (Human Services) and Bachelor of Psychological Science student at the University of South Australia. When she is not preoccupied with studying or participating in Youth Parliament, you can probably find her performing in local theatre or jamming out to Triple J radio. Really impressed with the Digital Direct Democracy Bill 2018, a digital voting platform is definitely a step in the right direction, especially appealing to new voters from this generation. You really nailed it here, Eli. Most impressed with your article. Well done. ← Think Global: The Catalan push for independence from Spain: tragedy and/or farce?